when I try to do this, I can link to my profile or to my app. lets say I chose to automatically publish my blog posts to my profile and not my app, then linking this to my profile is the right choice? besides, does the share on FB button also publish to my profile? so lets say I just want to get some more exposure on FB, can I auto publish to my profile? add like and share buttons and use insights linked to my profile, right? It would be great, if this function could detect, whether you are using a fanpage (as defined in the SFC settings) or the standard application page. 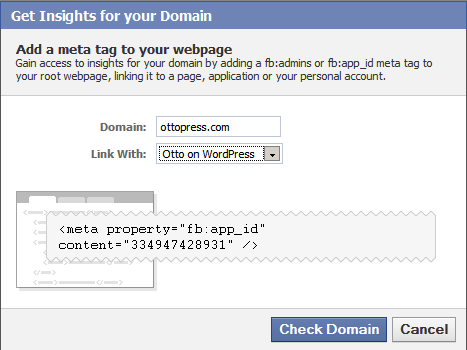 Or even better, a simple input box to override the standard setting with your custom meta tags. For the Insights section, you always want to use the App ID, not the Fan Page. It makes things simpler all around to use the Application as it was intended to be used. Which one you connect the domain to doesn’t actually matter. You see the same results either way. But connecting it to the Application lets any admins of that app see the domain info as well. If you’re the only one, then no big deal, but if you manage your site with other people, then they would be able to see the insights page too if you connect it to the app and they’re admins of the app. Probably not. I don’t know, I’m new to this stuff there too. I am trying to remove the captcha and replace it with a honeypot field, as the captcha is barely readable and many of our visitors complain about it in the feedback section. Where would i start looking? I cannot figure out where the captcha logic is. Can you recommend an approach to my task? No, I stopped supporting or developing that plugin a couple of years ago. The Captcha comes from Facebook’s systems, not from the plugin. There is no way to remove or alter it. I see that you have stopped supporting this plugin. Let me compliment you on it because it has been great. I don’t know if you have an easy fix for this, but I thought I’d try asking you anyway. Error Message: Cannot post to a user who has not installed the application. Any idea what is causing this? I’ve done nothing to my FB fan page or my site, and I have not edited the plugin information in any way. The plugin does not work anymore. It has not worked in almost two years. I stopped developing it entirely. Deactivate it, uninstall it, and use a different plugin instead. Just wanted to say thanks for this plugin – had used it a lot on several of my sites and it worked great, wasn’t actually aware it’s no longer being worked on – but thanks very much.